One year ago, I had one of those rainy day crazy-eyed ideas that I decided to act on. I thought it would be fun to get 1 necklace each month throughout the year. So I decided to launch the Necklace Club. It ended up being way more successful than I would of imagined and ended up being one of my highlights from 2014! I debated doing it again in 2015 mainly because I was afraid it wouldn't be as successful or that I would consider it a failure round two. But I decided that I needed to punch fear in the face and be brave. So I'm back for a second round and I hope YOU are too! 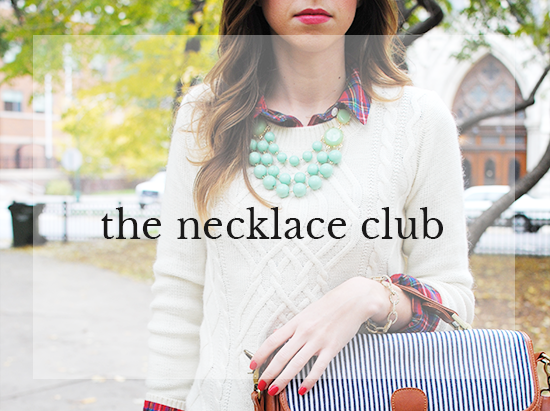 The Necklace Club is this: you'll receive one necklace at the end of every month in 2015. The total cost for the remaining of the year is $139.99 which includes all necklace costs plus shipping. The necklaces are valued at $19.99-$49.99. Once you join, you'll receive a survey to let us know your favorite colors and styles! You will receive 9 necklaces plus a bonus necklace for signing up in April! Also, you asked, I heard! After much thought I decided to add a monthly option for the Necklace Club as I understand paying $139.99 upfront can be a lot. And I wanted to make it affordable for everyone to join in! The monthly club plan will charge your account $16 each month on the day that you sign up for it for 9 months. Just click on the subscribe button below and follow the directions and then you are all set!